In this article I’m taking a look at the Best VPN for YouTube in 2016. YouTube, as we all know, is one of the best streaming websites available online, with millions of videos from few second clips to full-length documentaries and series there is something for everyone. Unfortunately though YouTube isn’t the same around the world. While some countries have full access, others like China have no access to it at all and some like Germany have huge numbers of videos that are blocked. In fact, YouTube is even slowed by some internet providers around the world due to it offering video streaming so you may even experience buffering and slow or jerky playback. Whatever your reason for searching for the best VPN for YouTube in 2016 is today I’m going to run through the 5 best VPN providers in order helping you select one of the best VPN options available. Tons of server options worldwide. No video buffering or delays. Location, location, location. When it comes to video streaming from YouTube then server location is king. If you suffer from slow playback, buffering, blocked videos or any other YouTube issue then VPN server location is key. IPVanish is the best VPN provider for use with YouTube due to the wealth of server locations they have on offer. Streaming video, especially in high quality requires speed and the distance to a VPN server affects this greatly. With local VPN servers in over 60 countries and IPVanish being one of the fastest VPN providers available, it makes them the ideal choice for YouTube. So regardless of where you are in the world IPVanish have you covered for your YouTube needs. IPVanish has software for Windows PC and Mac and also apps for iOS and Android which allows you to watch YouTube buffering free and video restriction free on any device in any country in the world. At just £4.22 per month or $6.49 in US Dollars for a 12 months account they’re also one of the cheapest providers in the industry and with a 7 day money back guarantee if you don’t like their service it’s totally risk free. Costs more than other providers. A little slower than some. Like IPVanish, ExpressVPN has a massive selection of servers, in fact, they have over 78 meaning they are even more widespread than most. If you live in a country where YouTube is blocked then this will allow you to bypass those blocks and watch videos in top speed. ExpressVPN aren’t quite as fast as IPVanish, but that certainly won’t affect video playback and you’ll be able to access YouTube and play videos as if you were in another location. Software and apps are again available for all major devices so your desktop and laptop systems are covered if they’re Windows or Mac and if you have an Android or iOS tablet or phone then you’ll be able to use the ExpressVPN app to connect to a VPN server and then use the YouTube app to access any video you want. ExpressVPN is slightly more expensive than other options but still a good deal at just £5.41 per month when taking a yearly package which works out at around US$8.32. One of the longest money back guarantees is available from ExpressVPN which gives you up to 30 days, if you’re not happy with the service or it’s not for you then simply request a refund. Offer a 3 day trial. VyprVPN makes a good third option for use with YouTube. Again they’re a provider with plenty of locations on offer and currently have VPN servers suitable for YouTube in over 42 countries. The great thing about VyprVPN is they offer a 3 day trial which isn’t something many VPN providers do offer. All you need to do is pop your payment details in and sign up. For the first 3 days you won’t be charged anything and if you cancel before the 3 days elapse it won’t cost you a cent (or penny!). VyprVPN do actually honour this and cancelling is easy to do via your control panel, it isn’t hidden away so you can’t find it. The three day trial allows you to try the service, access YouTube videos and see how it all works before you commit to paying. Like the two providers above apps are available for Android and iOS and software for Mac and Windows allowing you to watch YouTube anywhere regardless of what device you use. If YouTube is currently blocked in your country then opt for the VyprVPN Pro package which will allow you to bypass country censorship but if only certain videos are blocked or you’re suffering from buffering issues then the lowest package the VyprVPN Basic will suffice. Not as fast as other providers. HideMyAss is one of the most well known VPN providers in the world. With millions of customers and recently acquired by large anti-virus firm AVG, HideMyAss is definitely a name people trust. In terms of servers, HMA opts for virtual locations in many cases and the servers aren’t actually located there but close by in neighbouring countries. This allows you to appear as if you’re in places such as Cuba or North Korea even though the physical server might be located in Florida or South Korea. However, it does mean that you’re able to access YouTube from more locations than any other VPN provider in the world. HideMyAss boast over 193 countries to connect to on their service. While HideMyAss aren’t the fastest in terms of speed this does mean you can essentially pretend you are from almost any country and access YouTube content restricted to certain countries in nearly any country in the world. With a 30 day money back guarantee and software for all major devices including Linux, if one of the earlier providers doesn’t wet your appetite then HMA might be the ideal solution for you. Faster than most other providers. One of the cheapest available. If you’re still looking after the above four providers then my final option is LiquidVPN. Although LiquidVPN aren’t as big in terms of server locations they are fast and cheap and this is where they excel. If you’re from North America or Europe then the service will be ideal for YouTube. If you’re from Asia and near Singapore then the service will also be suitable. Outside of these locations speed will be an issue and so if you live elsewhere we would recommend one of the earlier providers. If you do live in the designated areas then LiquidVPN really are a good option for speed as they regularly feature at the top end of our monthly server speed tests proving their quality. You would have no issue streaming up to 4k video from YouTube and as they’re slightly cheaper than the other 4 options they do make a good consideration in your search to find the best VPN for Youtube. If you’re suffering the dreaded spinning circle or videos that stop midway without reason then it’s likely your internet provider is reducing the speed of your connection for video content. This usually happens at peak times so you may notice YouTube harder to watch at peak times. It’s surprising that internet providers actually do this but many in the UK, Europe and elsewhere are guilty of it. The UK internet provider EE are one such ISP who reduced the speed of video playback at peak times. With EE peak covers 4pm-1am on weekdays and 1pm to 1am on weekends so it isn’t a small part of the day either. They call it Traffic Management or Traffic Shaping. With one of the VPN providers suggested above your internet connection is encrypted so it is impossible for your ISP to determine what type of content you’re accessing, this means no reduced speeds on video playback which ultimately means no buffering on YouTube for you. Certain content on YouTube is only accessible to certain countries. 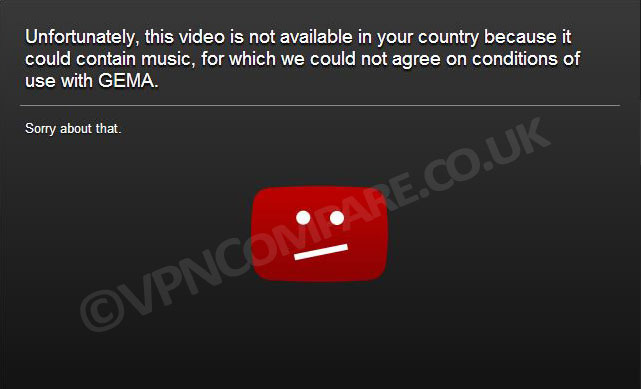 Germany is a big culprit of this with the music industry blocking many music videos due to licencing laws. YouTube video blocked in Germany. A simple VPN allows you to virtually reside in another country and bypass your local countries YouTube licensing laws. If you’re in a country that blocks certain videos then simply sign up to a VPN service, connect to another country and then visit YouTube like normal. Rather than being blocked from playing the video you’ll be able to stream freely. Countries such as China often block complete access to YouTube. Others like Turkey have blocked it in the past when civil unrest was taking place. If you live in a country where YouTube is permanently blocked or there is always the threat it could be blocked then a VPN will be the ideal solution. A VPN allows you to tunnel into another country and access YouTube thereby circumventing the blocks and censorship that is in place in your country. No more YouTube blocking, access it freely. YouTube Red is the recently released premium service from YouTube. It includes exclusive content, no adverts and the ability to download videos and play them offline or in the background. YouTube Red blocked outside the United States. At the time of writing it’s currently only available in the United States and if you try to access it from outside you’ll be blocked. You can however connect to a US VPN server and sign up. You get a 30 day trial and then it’s $9.99 afterwards. If you’re interested in knowing more then our dedicated YouTube Red guide will help you out. It’s written for UK and European users, but it works the same regardless of where you are in the world. I hope you’ve found this guide useful and now that you know the Best VPN for YouTube in 2016 is IPVanish you can sign up and free your YouTube usage no matter what problem you’re facing. If you don’t want to sign up to IPVanish for whatever reason then the other four providers listed make good alternatives. Just to recap, here are the Best VPN for YouTube 2016.